โปรแกรมตัดเพลง อยู่เซง ๆ หาเพลงกันเถอะ | Blog Com DD ต้องที่นี่!! WavePad โปรแกรมตัดแต่งเพลงไฟล์นามสกุล MP3 เป็น Ringtone สำหรับใช้กับโทรศัพท์มือถือแบบง่ายๆ โดยการนำเพลงเข้ามาในตัวโปรแกรมจากนั้นระบบจะแปลงเพลงนั้นออกมาเป็นแบบคลื่น wave เพื่อให้เราเลือกช่วงของเพลงแล้วตัดเอาเฉพาะส่วนใดส่วนหนึ่งของเพลงออกมา เพื่อนำไปใช้ทำ Ringtone จากนั้นเราก็เซฟเป็นไฟล์ชนิดต่างๆ ตามที่มือถือของเรารองรับครับ. If you need to mix two music tracks, or maybe you have a baseline and you would like to add your voice on it, try this easy to use mixer which lets you move, cut andmix all the tracks you need. By simply dropping the audio files into the time table display, you will see a wave display of your music, one per channel. Once you have all your files loaded, try to move them in the timeline, to cut and move the bits or to apply radio, add more bass, club sound mode and flanger effects. If you feel like to sing your favourite song and you wish to record your voice, give it a try with the function provided in Easy audio mixer. Although the application claims to remove voices from any song, so that you can add your voice, it didn't quite work with me. The final effect was just the original song with a lower volume. The program also fails to resize the frame as you need. This can be really annoying when you are working with more than two channels and you need to move tracks on the timetable. MP3 WAV Studio Software is an all-in-one solution for converting, This software can ripping, can burning and playing of audio files. 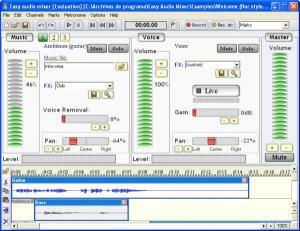 In addition,This Software the program can also create, encode, decode and convert between MP3 and other formats. Additional features include jitter-correction for ripping of scratched CDs, burn proof, batch conversions, drag and drop playlist creation, as well as a MP3 site manager and more.